Typhoon Soulik is experiencing what meteorologists call an eyewall replacement cycle. Major hurricanes commonly undergo this transformation when winds exceed 100 knots (115 mph/185 kph). An outer eyewall can develop as the eye becomes smaller in size and surrounding thunderstorms intensify. Soulik has weakened due to the outer wall overtaking the inner wall and closing the eye. If the eye closes completely, the storm has a chance of strengthening once again. This westward moving system, with winds of 95 knots (109 mph/175 kph) and higher gusts, remains a major threat to nearby regions. It is expected to hit the southern end of Ishigaki-jima Island tomorrow morning (July 12, 2013), northern Taiwan later tomorrow, and China on Saturday (July 13, 2013). Soulik’s eye was still open early this morning (July 11, 2013), but was becoming less distinguishable. 12 hours later, clouds have closed in on Soulik’s eye. Powerful Typhoon Soulik continues moving northwest toward the northern tip of Taiwan. As of 2100 UTC (4 pm EDT), this immense tropical system has reached Category 4 status with maximum sustained winds of 115 knots (132 mph/213 kph) and higher gusts. It is likely to reach Super Typhoon status with winds exceeding 137 knots (157 mph/252 kph) later this week. 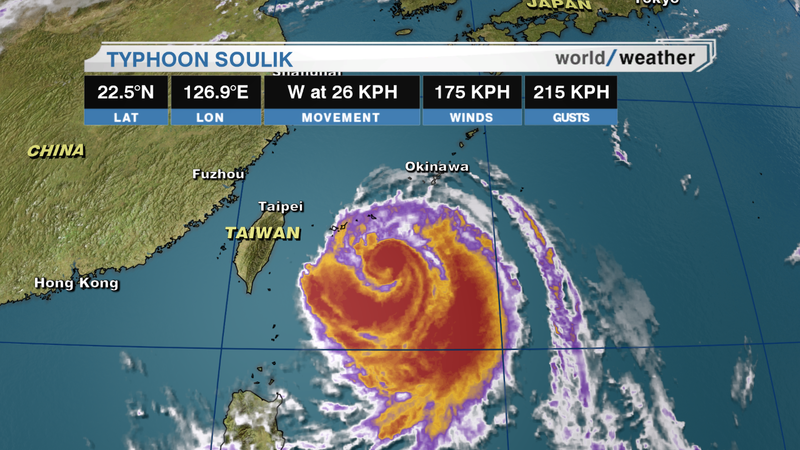 As announced by CNNi Meteorologist Tom Sater, Soulik is expected to hit Taiwan by Friday morning and China on Saturday. These intense winds could cause tremendous damage leading to blackouts and heavy flooding, thus warnings for this region have been issued.